Puppies and kittens are adorable, but they can be a hassle when it comes to potty training. Even if your pets are older, accidents can still happen. Spot removers and sprays can help to lift the stain out of your carpet, but they do not penetrate as deep as they need to effectively lift odor and other damaging residues. Carpet stain removal should involve a deep clean, not just a surface clean. If you have been searching for assistance with carpet stain remover in San Antonio, talk to our expert team. 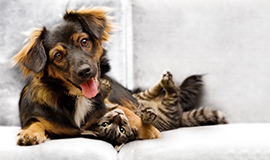 We can assist you with hard to remove pet stains. Although urine in carpet may not seem like the worse thing that could happen, it can in fact, cause some of the most severe problems. The longer the pet waste is left alone, the more problems you may see; and what could’ve been a simple clean, is now a complicated and expensive process. Don’t neglect pet stains, schedule steam cleaning services right away. With Steam Master Cleaning and Restoration’s pet urine treatment, you do not have to worry about what stains your pet may leave behind. Even if your stains are old, our carpet-cleaning methods effectively lift all stains and odors associated with accidents, leaving you with carpet that looks as good as new. Our goal is to completely remove not only the stain you see but what is left deep within the carpet fibers, eliminating all odors and ensuring no stain returns. The condition of your carpet matters to us. We believe in going above and beyond to treat and repair your carpet, enhancing the way it looks and feels. Whether it is just one stubborn stain or multiple spots, Steam Master Cleaning and Restoration can help you! Contact us today and let the experts go to work for you. We look forward to helping you with carpet stain removal in San Antonio. Steam cleaning could be the solution you have been seeking.